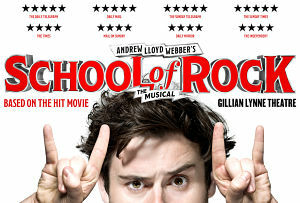 Based on the smash hit 2003 film of the same title, School of Rock features music by Andrew Lloyd Webber and lyricist Glenn Slater and a book by Julian Fellowes. School of Rock – The Musical is directed by Laurence Connor with choreography by JoAnn M. Hunter, set and costume designs by Anna Louizos, lighting design by Natasha Katz, sound design by Mick Potter, music supervision by Ethan Popp and hair design by Josh Marquette. Based on the iconic, hit movie, this musical follows Dewey Finn, a down-on-his-luck wannabe rock star who decides to earn an extra bit of cash by posing as a supply teacher at a prestigious prep school to make ends mee. There he turns a class of straight A pupils into a guitar-shredding, mind-blowing rock band. When he discovers their musical talents, he enlists his fifth-graders to form a rock group and conquer the Battle of the Bands but can he get them to the competition without their parents and the school’s headmistress finding out? Craig Gallivan is leading the London cast as wannabe rock star Dewey Finn. He will be joined by Laura Tebbutt as Rosalie Mullins, Alan Pearson as Ned Scneebly and Rebecca LaChance as Patty Di Marc0. Jake Sharp will play Dewey Finn at certain performances. The remaining adult cast comprise John Addison, Nick Butcher, Rob Falconer, Martina Isibor, Claudia Kariuki, Jessica Louise Parkinson, Richard Morse, Andy Rees, Hannah Stratton, Alex Tomkins and James Wolstenholme with swings Paul Kemble, Jessica Kirton, Billy Mitchell, Catherine Morris and Andy Prosser. Thee three teams of twelve kids who make up Dewey’s band, and play live at every comprise Sebastian Adams-Eaton (eleven years old from Suffolk) Jasper Bew (eleven years old from London), and Amos Mayland (eleven years old from Cornwall) who will play Zack; Nayan Gupta (eleven years old from Sheffield), William Harvey (eleven years old from Stockport) and Jack Manders (nine years old from Buckinghamshire), who will play Freddy; Daniel Chang (eleven years old from London), Noah Gupta-Wright (thirteen years old from London) and Caspar Lloyd (eleven years old from Colchester) who will play Lawrence; Millie-Jayne Evans (nine years old from Plymouth), Evie Lawley (ten years old from London) and Sofia Wilkinson Hill (eight years old from Merseyside) who will play Katie; Tommy Featherstone (ten years old from London), Jakub Kopec (eleven) years old from Surrey) and Will Tarpey (twelve years old from East Sussex) who will play Billy; Delilah Bennett-Cardy (ten years old from Hertfordshire), Amelie Green (eleven years old from London) and Nancy Hartley-Blake (eleven years old from Teesside) will play Summer; Kaylah Black (twelve years old from London), Tallulah Byrne (twelve years old from Chelmsford) and Sara Sheen (thirteen years old from Manchester) who will play Tomika; Ikechukwudi Machie (ten years old from London), Teni Taiwo (twelve years old from Hertfordshire) and Stanley Voss (twelve years old from Buckinghamshire) who will play James; Calypso Bailey (twelve years old from Essex), Savannah Pages (eleven years old from Surrey) and Shani Roberts (ten years old from Essex) who will play Marcy; Maxwell Apple (ten years old from London), Todd Dachtler (eleven years old from London) and Vaughn Arthur Endraca (twelve years old from London) and who will play Mason; Tia Belle Keilty (ten years old from Hertfordshire), Lily Jean Jackson (eleven years old from Essex) and Naniyah Owusu (nine years old from Essex) who will play Shonelle; Charlotte Breen(ten years old from Bromley), Chloe Marler (nine years old from Essex) and Ellie Pavitt (eleven years old from Essex) who will play Sophie. Buy tickets for School of Rock which is booking to 20th October 2019. Infra-red system with headsets and neckloops. Induction loop at Box Office. Headsets available in foyer. Access dogs are allowed inside the auditorium, staff can also dog-sit for four dogs per performance in the Manager’s office. No steps through double swing doors into the foyer. Box Office to the right with lowered counter. Escalator up from the main foyer to the mezzanine level and then a further 32 steps up to the Stalls, or 41 to the rear Stalls. 65 steps up to the Dress Circle (threesteep steps between rows). Venue is carpeted throughout and all staircases are highlighted with handrails on either side. Theatre opens 45 minutes before the performance.. Adapted toilet en route from the lifts to the auditorium..